(Nanowerk News) NEI Corporation is developing a lithium-ion battery where the electrolytes are dissolved in water instead of an organic solvent. The aqueous-based lithium-ion battery has the potential to eliminate the risks associated with state of the art lithium-ion batteries, where the organic solvents are highly flammable. In the event of a battery overcharge or a short circuit, the organic solvents pose serious safety hazards. A number of cases of lithium batteries catching fire have been reported in recent years. Aqueous-based lithium-ion batteries also have the potential to significantly reduce cost, measured in terms of $/kWh. 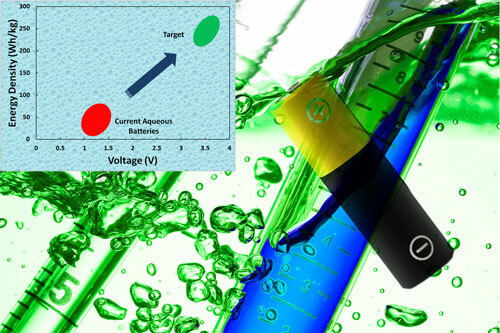 While the concept of a lithium-ion cell using a water-based electrolyte has been known and studied, a major limitation is the narrow electrochemical stability window for water, which restricts the cell voltage. For example, the electrochemical stability window for water is within the range of 0 to 1.25V; electrolysis of water occurs outside this voltage range. In contrast, organic solvent-based electrolytes are stable up to at least 4V. The lower the cell voltage is, the lower the energy density is, and consequently, water-based lithium-ion batteries have had low energy densities. Recently, scientists and engineers at NEI Corporation have developed new materials concepts that can overcome the voltage stability issue of water-based lithium-ion systems. The innovations pertain to the composition and morphology of the materials used in the lithium-ion cell. The aqueous-based technology is being developed with funding from the Environmental Protection Agency’s Small Business Innovation Research (SBIR) Program. NEI has been a long trusted source for customized cathode and anode materials used in lithium batteries. The company specializes in developing new compositions and particle morphologies, including nanoscale particle engineering and surface modification. NEI’s MATCH service – Materials Analysis, Testing and Characterization – also plays a critical role in assisting new materials development. NEI has an extensive battery characterization and research facility, which includes multi-channel cell testers, as well as conventional and customized electrode material manufacturing capabilities using both solid state and solution-based methods. By offering cost-effective products, comprehensive materials development, characterization, & electrochemical testing services to its customers, NEI is able to accommodate to a variety of customer needs. NEI Corporation welcomes the opportunity to partner with a battery manufacturer to co-develop, test and qualify the water-based lithium-ion batteries. NEI Corporation is an application driven company that utilizes nanotechnology to develop and produce advanced materials. The company’s core competencies are in synthesizing nanoscale materials and prototyping products that incorporate the advanced materials. NEI Corporation offers cathode and anode materials (both powders and coated electrodes), and solid state electrolytes for use in lithium-ion batteries. The company produces battery materials through a scalable and economical synthesis process, which is adaptable to different materials compositions and particle morphologies.